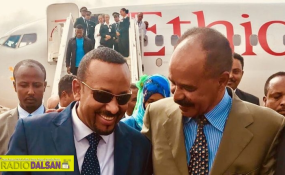 Prime Minister Abiy Ahmed arrived in Eritrea’s capital and met up with President Afwerki in Asmara. ADDIS ABABA- Abu Dhabi Crown Prince Sheikh Mohammed bin Zayed Al Nahyan gave yesterday United Arab Emirates' highest honor, the Order of Zayed for Prime Minister Dr. Abiy Ahmed and Eritrea's President Isaias Afeworki at a ceremony held in Abu Dhabi Presidential Palace. An Eritrean-Ethiopian-UAE Tripartite Summit was held yesterday in Abu Dhabi, the capital of UAE. In his opening remark at the Summit, the Crown Prince hailed the historic peace agreement between Ethiopia and Eritrea for paving the way for improved bilateral relations. The agreement also contributes to enhance the security and stability of the two countries and the Horn of Africa at large. Sheikh Mohammed also said that the bold and historic step taken by leaders of the two countries to end the conflict and open new horizons for cooperation and joint coordination is a model for the world. The Crown Prince stated that the bold historic step that led to the signing of a peace agreement between the two leaders reflects their astute statesmanship and paves the way for years of stability, development and prosperity for Ethiopia and Eritrea. Sheikh Mohammad expressed his confidence that the step will contribute to further cooperation and joint coordination between the two countries and fulfil their people's aspirations for peace and development. He underscored that the deep relationship the UAE enjoys with both Ethiopia and Eritrea, and their common interests will enhance the prospects for peace and development and contributes for ensuring peace and stability in the East African and Arabian Gulf regions. The UAE expressed its support for the peace agreement between the two countries in the interest of maintaining a proper relationship in a framework of good neighborliness and respect for international laws and charters. The Crown Prince also re-affirmed his country's commitment to consolidate its partnership with Ethiopia and Eritrea and to back their efforts for development. "The UAE and KSA are key supporters of any effort aimed at achieving peace, security and stability that serves the interests of the people of the region and enhances security". Dr. Abiy and President Isaias reportedly appreciated the role leaders of Saudi Arabia and UAE have been playing in pushing forward the peace agreement to be a catalyst for positive relations that will benefit the two countries and the Horn of Africa. The leaders also thanked the two countries for the efforts they have made to end the Ethio-Eritrean standoff. In the statement issued after the Summit, the parties called upon the international community to support the historic and constructive agreement to promote peace, stability and development and benefit peoples of the two countries. Earlier this month, Ethiopia and Eritrea formally reestablished diplomatic relations and signed a declaration of peace and friendship in the Eritrean capital Asmara and the move was welcomed across the globe.